While I was in Indianapolis, I looked up cases native to Indiana. I came across one that boggled my mind. 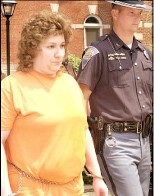 The choice that Judy Kirby made one fateful March day in 2000, still haunts the town of Martinsville, Indiana. I also go off script and share a story very similar to Judy’s. One that occurred in my hometown of Plano, TX. I would like to Welcome to the Club our most recent Patreon Supporters: Heather P, BeKindCali / Jill C, Tawny and George from the Dirty Bits Podcast, Doffeliten, Ashley C, Ariel M, Carol C, Emma Z, Mike Brown from the Pleasing Terrors Podcast, Hey why the face/Sara T, Nicole R, Alison M and Angela S! Thank you to Jillian host of the Court Junkie Podcast for voicing Judy’s Intro. You’re amazing. We have a fun announcement!! We are partnering with True Crime Clothing to do a giveaway!!! Head to the website for details on how to enter. One lucky winner will be announced on 7/30/17!! Entries are being accepted now!